To download, save and print my Children and Family Pricing in pdf form, Click Here! To download, save and print my Session Fees Pricing in pdf form, Click Here! 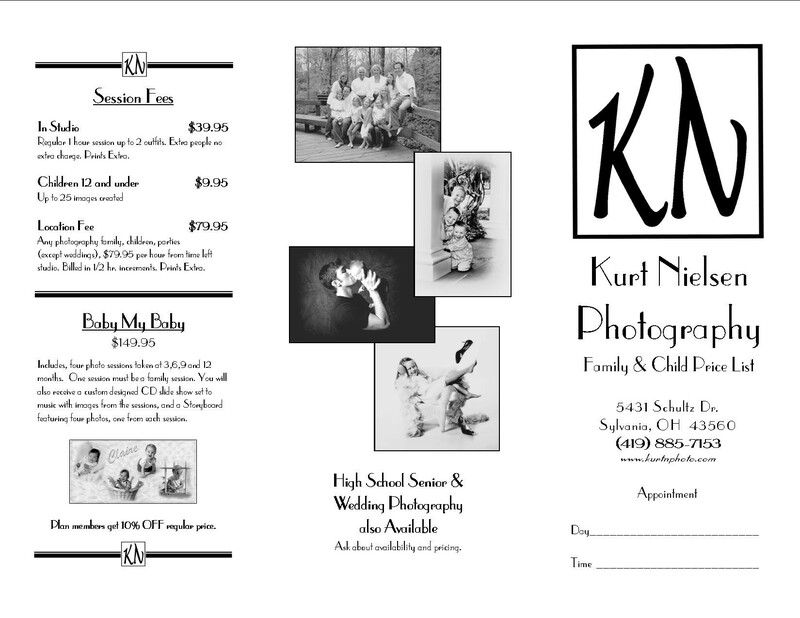 Kurt Nielsen Photography Portrait Studio is located in Sylvania, OH and proudly serves the greater Toledo area. Unlike the chain store photography studios, Kurt does everything by appointment. This ensures you that there is no waiting time in a lobby full of people. All appointments are one hour in length which allows for multiple clothing and set changes. Of course, the more clothing changes you make, the less time he has to photograph you. Kurt therefore advises only one or two clothing changes to allow for more photographs to choose from. If your photo session is for a baby or small child, Kurt advises that you keep your child on as normal of a schedule as possible. Make sure your child is well rested and fed before coming to the studio. If you have to take time out to feed your child, you will have less time for Kurt to take photos. Chances are, there will be another photo session scheduled immediately after your appointment and Kurt wants to be sure you have as many images to choose from. It is also important to remember that if you have a lot of activities on the day before your scheduled appointment date, your child may not do as well as if he/she would on a normal routine. You should also be aware that if your child is teething or otherwise not feeling well, they probably won't do as well during their portrait session no matter how happy of a baby he or she is. Kurt's portrait studio has over a dozen permanent sets, dozens of backdrops, and more props than you can imagine. However, Kurt feels that every photo session should represent the personality of each individual involved. If you want to bring in your own props to add your or your child's personality to your photos, feel free to do so. Kurt also offers on-location photography. He can go anywhere you want him to go whether it be your house, your favorite park or beach, or other destination. Location fees do apply. Kurt Nielsen Photography uses a print lab that only professional photography businesses have access to, ensuring the best quality print that will last a lifetime. Kurt also offers canvas, door and poster sized prints, storyboards, painted images, photo collages, art books, brag books, photo albums, photo sculptures, and framed portraits. 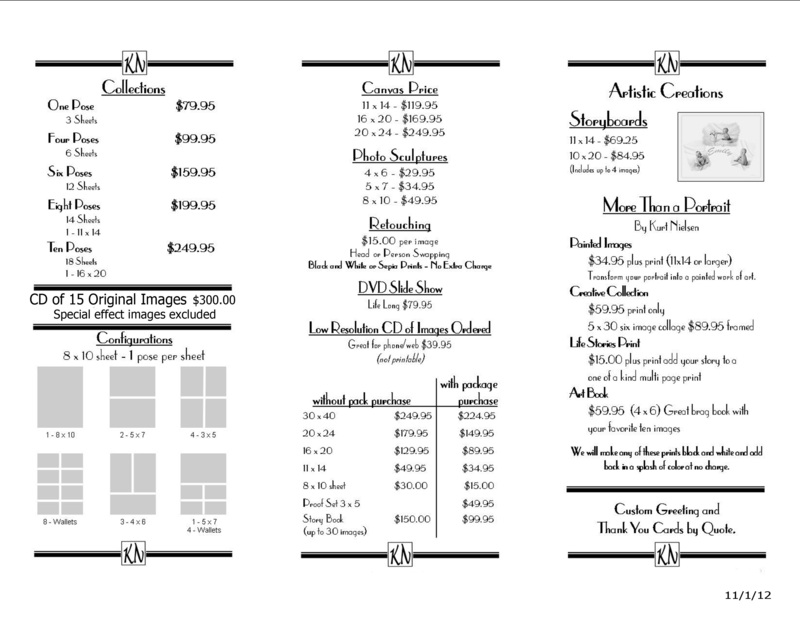 All portrait packages are your choice of size and pose of the 8x10 print sheets. If you see something at another portrait studio that you want, ask Kurt if you can get it for you. Chances are, he can! For more information or to schedule your portrait photo session, please call (419) 885-7153,. Thank you for your interest in Kurt Nielsen Photography!